On March 5, 2019 Workforce Solutions of Southeast Texas acknowledged the support and commitment of businesses that support their mission ‘to create a world-class, competitive workforce’ through financial support of the annual Youth Career Expo. The goal of connecting our future workforce to occupations and careers through interaction with local employers, businesses, and training institutions was realized due to the support of our sponsors. Student and teacher survey results indicated an overwhelming support and acknowledged the importance of educating students about occupations and careers. 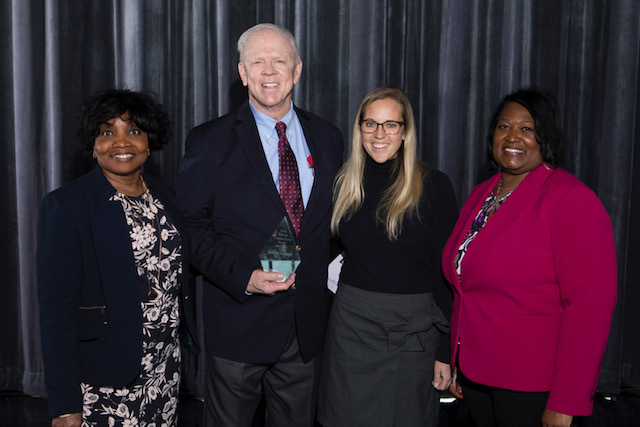 Dennis Isaacs, Executive Director, Golden Triangle Business Roundtable was recognized as a sponsor for this event by representatives of the Workforce Solutions of Southeast Texas…. (LtoR)….Pam Wise, Community Liaison, Lauren Van Gerven, Business Solutions & Local Labor Market Analyst, and Marilyn Smith, Executive Director.